This page shows how to serve an API from a custom domain that you own, for example, example.com. As an alternative to using your own domain name, you can use a domain name managed by Google. See Using a domain managed by Google for more information. Obtain a domain name from a domain name registrar if you don't already have a domain name to use for your API. Name your API host name with your domain name. If you are using SSL with your domain, obtain and upload your SSL certificate. Deploy your API and Extensible Service Proxy (ESP). Follow the instructions in the appropriate tab. The recommended way to serve an API from Compute Engine instances is to use a load balancer across an instance group. You need to reserve an external IP address for the domain name and use that external IP address for the load balancer. For Attached to, click None. You attach the IP address to a load balancer later. Assign any name you want for the group and add a description. From the Zone list, click the zone used by your API instance. In the VM Instances field, add the VM instance running the API. Click Define a Backend Service > Create or select a backend service. Assign any name and description you want for this backend service configuration. In the Protocol field, select the protocol you want to support through the load balancer, HTTP or HTTPS. In the Instance group list, click your instance group. In the Port Numbers field, enter 8080. Enter a name for the health check configuration. To accept the remaining default values, click Save. For now, accept the defaults for the rest of the configuration. You can make changes later as needed, such as additional ports. You don't need to set anything in the Host and path rules; you can forward everything to your backend API by using the default Any unmatched filters. This means that all traffic into the load balancer is directed to the API on the port 8080 (the default port) as defined in the preceding steps. In the IP list, click the external IP address you created earlier. For the HTTPS protocol, you need to use SSL. In the Certificate list, click the certificate you want. Optionally, if you want to support another protocol, click Add frontend IP and port, specify the protocol, the same external IP address, and a different port. 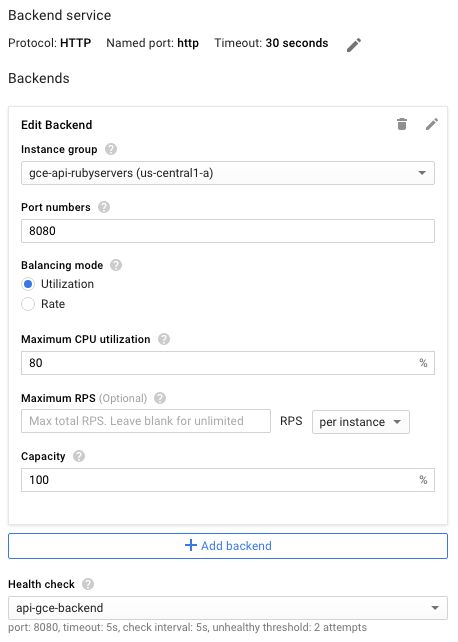 To create the fully configured load balancer, click Create. If the Create button isn't enabled, check the components you just configured: a checkmark should appear beside each of the configuration components. A missing checkmark means you haven't completed the configuration. After your DNS changes propagate, requests are sent to your API by using the load balancer. Note: If requests aren't making it through to your API backend, check your project's firewall rules to make sure your instances can accept traffic on the default ESP port 8080. For more information, see Firewalls. 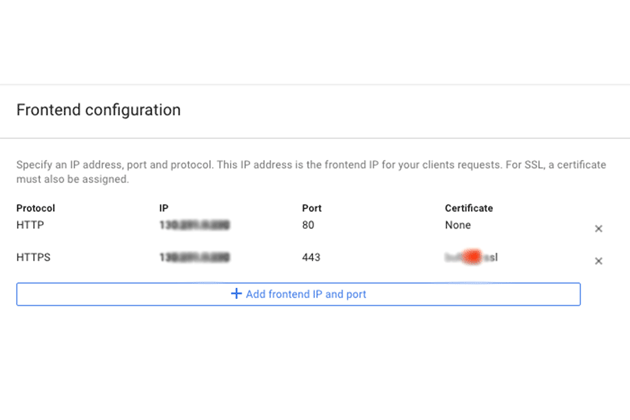 To serve an API over a domain for Google Kubernetes Engine (GKE), you need to expose ESP as a service, by using the returned external IP address for your domain's DNS settings. Note that GKE automatically does load balancing for you. Make sure the targetPort matches the port used by ESP configured in your API backends. ESP uses port 8081 by default. Note: It takes awhile for the API to be exposed as a service, and the external IP isn't visible until this process is complete. So you might have to run kubectl get services several times before you see the IP address. Change the generated external IP from ephemeral to static. Select your external IP address from the list. In the Type list, click Static. Visit your domain provider account and edit your domain settings. You must create an A record that contains your API name, for example, myapi.example.com, with the external IP address in its data field.